The reigning NBA Rookie of the Year is joining the newly crowned Super Bowl champ to rally the NBA and the NFL around a cause they both care about. It’s the stuff University of Virginia sports fans’ dreams are made of. Fan favorite Malcolm Brogdon, the 2017 NBA Rookie of the Year and one of the most accomplished players in Cavalier basketball history, announced Thursday that he is teaming up with fellow ’Hoo and Philadelphia Eagles defensive end Chris Long, who is still riding high from the Eagles’ long-awaited Super Bowl championship last month. As decorated as both athletes are, however, their new partnership won’t focus on the court or the field. 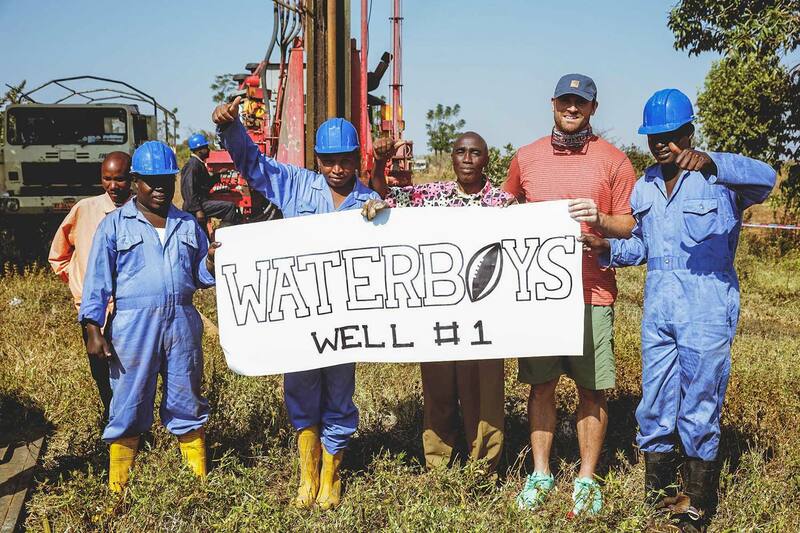 Instead, Brogdon, who now plays for the Milwaukee Bucks, will be the first NBA ambassador for Long’s Waterboys Initiative, raising money and recruiting fellow players to support the installation of deep-borehole wells to bring clean drinking water to communities in East Africa. Long started the organization in 2015 after visiting local communities during his first trek up Mount Kilimanjaro in Tanzania. Inspired by the region’s people and its beautiful natural scenery, Long realized that he could use his platform as an NFL player to bring clean water, and all of the benefits that come with it, to the villages he visited. Long’s initial goal was to build 32 clean water wells – each costing $45,000 and supplying up to 7,500 people – to represent the 32 NFL teams. Fittingly, Waterboys achieved that goal the same week that Long and the Philadelphia Eagles won the Super Bowl last month. Long was pumped, and he was excited to expand the mission to other sports. Brogdon, who graduated from UVA in 2016 with a bachelor’s degree in history and a master’s degree from the Frank Batten School of Leadership and Public Policy, has long expressed a passion for helping African communities. He said the abiding interest began with a three-week trip to Ghana with his family in elementary school, when the future NBA star volunteered in daycare centers and maternity wards with his parents and two brothers. “That lit the fire for me, of really being passionate about clean water, about poverty, about helping people that are less fortunate than I am,” Brogdon said of the trip, speaking in a video announcing his collaboration with Long. Like Long – who donated his entire 2017 season salary to charitable causes, including scholarships in Charlottesville – Brogdon backs up his words with actions. While still a student at UVA, he used his thesis project to partner with PureMadi, a UVA-based, not-for-profit organization that collaborates with local citizens in South Africa to design, test and produce affordable ceramic water filters that use silver nanoparticles to purify water. Later, as an NBA rookie, Brogdon eschewed custom and asked the Bucks to take the money budgeted for his Rookie of the Year public relations campaign – typically gimmicks and promotional packages used to convince voters – and donate it to charity instead. Now, he is looking forward to bringing Long’s clean water mission to the NBA. “I have been following Chris Long for a long time, because he is a fellow UVA alumnus,” Brogdon said in the video. If their individual track records are anything to go by, the world better be ready. Good things can happen when two ’Hoos like these team up.